Day 252: Blog By Committee . . . So, here we are huddled in a hotel room in Lufkin with members of both sides of the family. As we’ve blogged about over the past few days, we are counting down the hours until D#1 walks across the stage and accepts her college diploma from our alma mater. Wow, hard to believe it’s been four years since we went through this at the high school level. Where has time gone? We continue to contemplate the mysterious fact that our children have aged and we have remained ageless – but that’s a discussion for another night. 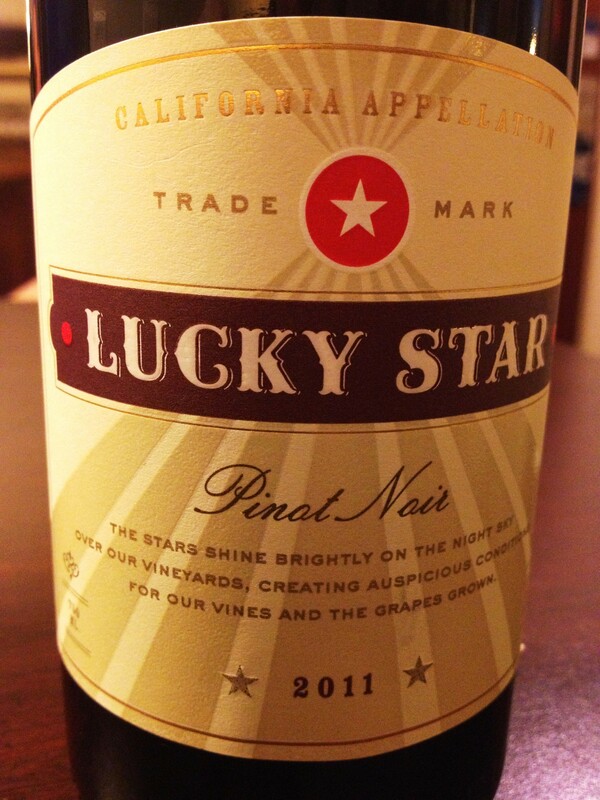 Tonight’s wine is a 2011 pinot noir called Lucky Star. From the great state of California this wine received a wide range of reviews – here we go . . . please note: there are no glass items allowed at this fine establishment – therefore we are partaking of this wine in vessels from International Paper – we will handicap the wine and give some points for this consideration. Buy again? nope, no I wouldn’t – but would help Roger drink it, I didn’t buy it this time – probably wouldn’t – would rather buy beer, I would most definitely – and promise to finish the bottle before the night is over. So, there you have it – a gentle reminder that everyone had a different opinion of wine and what they like. We have state that none of our opinions are included above – tonight we decided to rely on those around us. Truth be told, it is fun to discuss wine with others and blog by committee – a little rough with this rowdy group, but better than turning on the television. We will share that we purchased this wine for well under $12 at HEB. We aren’t thinking that we will purchase again, but do love the label – “Star Light, Star Bright, Your Pinot Noir Wishes have been granted”. Not so sure about this by committee thing, while interesting, is the best way to go – but as mentioned it did provide tonight’s entertainment. Until tomorrow, remember to enjoy responsibly and recycle whenever possible. Categories: Uncategorized | Tags: Lucky Star Wine, Lufink, SFA Graduation | Permalink.